OK, don't panic.Yes, it's true this post is about eating dolphin, but I am talking about dolphin fish as opposed to dolphin the whale. It's usually sold under the Hawaiian name of Mahi-Mahi, which means "Strong Fish" though sometimes you can find it marketed under it's Spanish name "Dorado". I was first exposed to Dolphin fish while reading "The Old Man and the Sea" by Hemingway during my Sophomore year of High School. For it was just before nightfall on the second day, after being towed far out to sea by the Marlin, that a Dolphin takes his second line. Several people, including myself were a little horrified when he begins to fillet it out, and eat it, along with the flying fish he found in it's stomach. Mrs. Larkin, our English teacher, quite calmly explained that the dolphin that Hemingway was referring too, was a Dolphin "fish" not a Dolphin "mammal" like Flipper. Whew! This is a dolphin fish, and they are tasty. 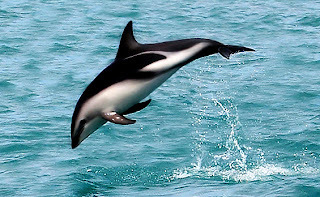 This is a dolphin and they are not for eating. Well, that is unless you are in Japan or Peru. Did you know an Orca is a dolphin? I didn't. I grew up hearing the term "Killer Whale", so I just assumed they were whales. And while it's true that all dolphins are technically whales, not all whales are dolphins. I have always been curious as to the flavor of Dolphin, since my sophomore year... All I really knew about it was that it eats Flying Fish... Flying Fish attract the Dolphin, the Dolphin attracts the Tuna and the Tuna attracts the Marlin. That, and Santiago saying it was too sweet. Flash forward about 15 years, it's the year 2000 and I am meandering through the frozen fish section of Trader Joe's in San Diego. I grabbed some Coho Salmon and some Albacore Tuna. I quickly skip past the Orange Roughy, having just recently found out about the Mercury content, when I notice this package of fish labeled Mahi-Mahi... Next to the Ahi Tuna. I figured it was some new species of Tuna, considering it's location in the cooler, so I grabbed a package and headed towards the check-out. I had given up "meat" at the time and, since I am "allergic" to all things of the nonfermented soy persuasion, I was really big on fish as a lean healthy source of protein. I will even hazard to say that I was a "Pescatarian". It's an environmental hazard of living in SoCal. Everyone seemed to have dietary requirements ending in "an"... Vegetarian, Pollotarian, Vegan, Fruitarian, Pescatarian.... blah blah blah. (This was pre-locatarian) Anyway, I got home with my cryo-packed prizes and decided I was going to try this Mahi-Mahi "Tuna" for dinner. It was a little on the sweet side, but nice and solid, kind of like Tuna, but not as "steak-like" as Tuna can be. It was more like a cross between Cod and Halibut. On the whole, I found it rather tasty, so I added it to my weekly shopping list. It wasn't until about 3 years later, when I was cruising the net looking for new ways to cook this Mahi Mahi, that I found out that it was Dolphin Fish, just like in The Old Man and the Sea. I normally bake my Mahi Mahi in the oven, drizzled with Olive Oil and sprinkled with a Hazelnut Crust, but I have enjoyed it immensely pan seared in butter with a squeeze of lime as well. Tonight, however, I am breaking out of my mold, as it were. When Laura Calder made her Sauce Nantua, she used it to adorn a Mousseline of Turbot (instead of Dover Sole or Haddock). A Mousseline is sort of a mousse baked in a water bath. Granted, most mousse have gelatin in them and whipped cream folded in before they are chilled, but the idea of a Mousseline is similar, you just add the cream ahead of time, and process the heck out of it in the food processor to drive some air into it to lighten it up before gently baking. As I said, Laura used Turbot, which is a nice fish and all, but I decided that I can always use a new way to prepare Mahi-Mahi. So this is my spin on her spin. Line the bottoms with parchment paper, and butter the parchment as well. Cut the Mahi-Mahi into pieces. Place the Mahi-Mahi in the bowl of your food processor, along with the Egg and the Heavy Cream. Process this until a sort of paste forms. Remove the blade and stir in a pinch of Kosher Salt and Black Pepper along with the chopped Tarragon and Parsley. Spoon into your prepared ramekins. Place the ramekins in a baking pan. Move the baking pan to the oven and fill the pan with enough boiling water to come half way up the sides of the ramekins. Bake for 20 minutes, or until the center is just set. Spoon Sauce Nantua around the Mousseline. Garnish with a Parsley Leaf or a Tarragon spring. I have eaten mahi mahi ages ago, I can't even remember what it tasted like but I remember I didn't care for the restaurant as a whole so I am thinking it wasn't memorable. After hearing your explanation of the flavor, I will have to try it again. Yes, when I ordered it I had to be reassured that it was not the dolphins that always complete my beach vacations when I see a school of them swimming along. Are mousselines usually a dessert? Very interesting reading, and I had no idea about the orange roughy although I haven't had any in a while. I hope there is nothing bad about tilapia, it is our favorite right now. You should be fine with tilapia, the mercury content usually has to do with how long the fish lives. It builds up in their system over time. Honestly, the bad ones are Shark & Swordfish (both of which I LOVE) Orange Roughy got a bad rap because it was higher than Albacore Tuna or Cod. But Chilean Sea Bass and Halibut are higher than Roughy. I think the whole "Mercury Scare" was a marketing ploy, because the numbers keep changing every couple years. I love halibut also, it is pretty expensive around here, so I don't get it very often.